A report released by the US State Department has opined that building the Keystone XL pipeline "won't have a major impact on Alberta's oilsands development". 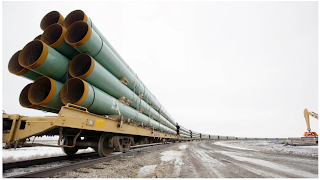 This is a tacit acknowledgement that the real reason for opposition to the pipeline isn't the risk that the pipeline itself poses (the report says it is no riskier than any other mode of transportation), but that it would encourage greater development of what is widely perceived as a dirty fuel. Saying that Keystone won't increase development is thus a strange way of hinting that they're getting ready to approve it, and indeed State Department approval was apparently a major hurdle the pipeline needed to get over. Is the report correct? Probably not entirely - I think pipeline capacity could be a major dampener on oil sands projects if it doesn't grow significantly. But that's making the big assumption that Keystone is the only game in town, which it isn't. Although things look glum at the moment, further pipelines to the BC coast are certainly possible. I think that's what's written between the lines on this announcement - oilsands crude can either go to the US via Keystone or China via Northern Gateway. It's going to get extracted and sent somewhere either way, might as well make it America.